"I played it at Rezzed, and it's good—like Phoenix Wright, but with Victorian birds," Phil said of Aviary Attorney this morning, and what more need I add but to say that it's out on Steam on December 18? Ok, perhaps a little context would be appropriate. LEGAL TERM OR VICTORIAN BIRD? In mid-19th century Paris, bird-brained attorney Jayjay Falcon and his assistant, Sparrowson, hit upon a lucrative contract: "Bourgeoisie kitten" Caterline Demiaou is up on murder charges, and you need to get her off the hook. 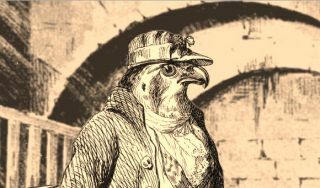 Like Phoenix Wright, Aviary Attorney is divided into evidence-gathering and legal wrangling phases, but it's possible to fluff a case completely and still progress the story one way or another. Aviary Attorney is the mad brainspawn of a two-person team, Jeremy Noghani and Mandy Lennon, who were inspired by the whimsical illustrations of JJ Grandville. The backgrounds and music were drawn from public-domain 19th-century sources—sticking it in a game is the sort of strange oxymoron that commends it to me.